With recent headlines about Ebola in west Africa, the Congo, and it's terrifying outbreak with fears of it's spreading across the world, along with the now drowned out news of "forgotten" smallpox vials, as well as more than 300 other vials containing biological materials such as dengue, influzena, Q fever, ricksettsia and many more deadly viruses and diseases, a "rare virus spreading in the US that only attacks children and strange changes to the CDC website, it is critical for people to be reminded of a Russian scientist by the name of Ken Alibek aka Dr. Kanatjan Alibekov, who defected to the United States in 1992. Mr. Alibek is a is a former Soviet physician, microbiologist and biological warfare (BW) expert described by PBS as "Dr. Kanatjan Alibekov was the former First Deputy Director of Biopreparat from 1988 to 1992. Biopreparat was the Soviet Union's biological weapons program. Alibekov defected from the Soviet Union and moved to Washington, DC in 1992." In an interview, when asked if biological agents were to be utilized, how long would it take to prepare them for use, his answer was "it would take no more than two to three months," but it is the followup answers in the PBS interview that should be noted carefully about the types of biological weapons the Soviets were experimenting with. What biological agents were worked on at the time that you were involved with the program? The completely finished and accomplished biological weapons were as follows: smallpox biological weapon, then plague biological weapon, anthrax biological weapon, Venezuelan equine encephalitis biological weapon, tularemia biological weapon, brucellosis biological weapon, and some others. In the 70s and beginning of 80s the Soviet Union started developing new biological weapons--Marburg infection biological weapon, Ebola infection biological weapon, Machupo infection, [or] Bolivian hemorrhagic biological weapon, and some others. 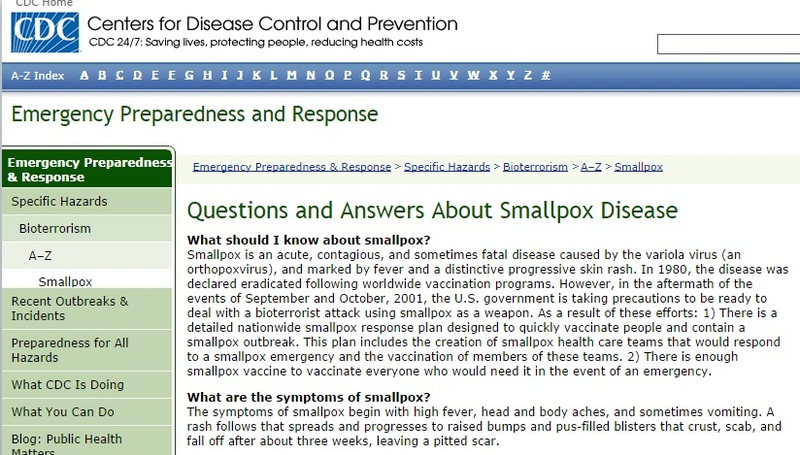 Yes, it's a good question, because smallpox was declared eradicated in 1980. And just immediately after, the Soviet Union government realized that nobody would have defense in the future against this agent, because it was declared [that] there was no necessity to vaccinate people any more. This weapon became one of the most important weapons, because the entire population of the Earth became absolutely vulnerable to this agent and to this weapon ... smallpox is very contagious. A relatively high mortality rate: 35-40%. And if the entire population of the Earth doesn't have immunity against this agent, possible consequences after applying these weapons would be horrible. Which brings us to the "Ebolapox," defined in the CBC.ca biowar dictionary, on February 18, 2004, as "A genetic combination of Ebola and smallpox, said to have been developed by Russian biological weapons experts. Parts of the Ebola virus were grafted into a smallpox virus." Because genetic material of the Ebola virus is integrated into another microorganism, under a microscope the hidden Ebola virus looks like smallpox, but obviously it isn’t. So a new dangerous microorganism creature is made. The so called Ebolapox, however, released into a society would eventually come back to the people who release it. Therefore, one would have to take it a step further and develop an Ebola pox that would only infect a specific genetic target group. This would insure that the ethnic group releasing it would not become infected. Therefore it is almost unbelievable that the Ebola outbreaks in Africa are caused spontaneously for I know that scientist are able to connect Ebola to a certain specific genetic loci of the DNA system. And this control over the artificial made Ebola disease is the only explanation that Ebola hasn’t become an epidemic or pandemic disease in Zaire and Uganda or surrounding countries. 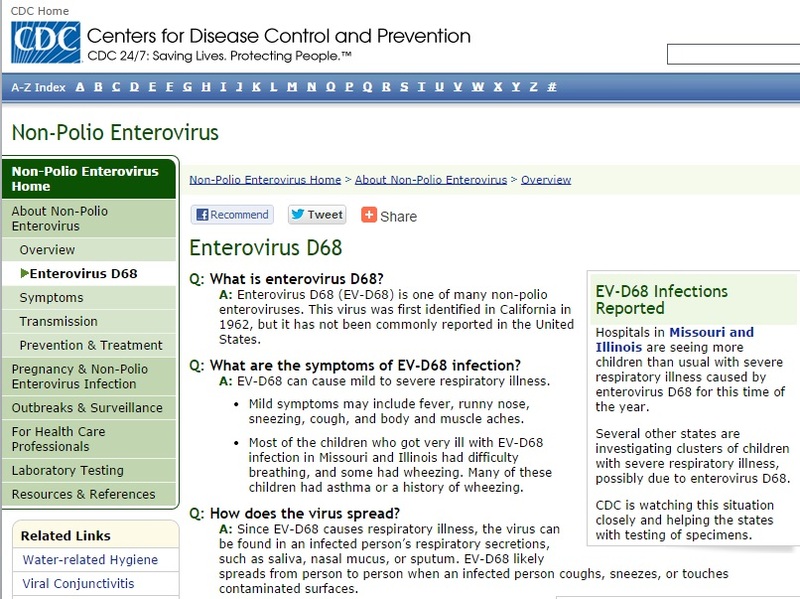 In addition to all of the above, there is a "rare" virus, EV D68, that is rapidly spreading in the United States with cases in 12 states and continuing to spread, having moved from the South and Midwest, to the Northeast. 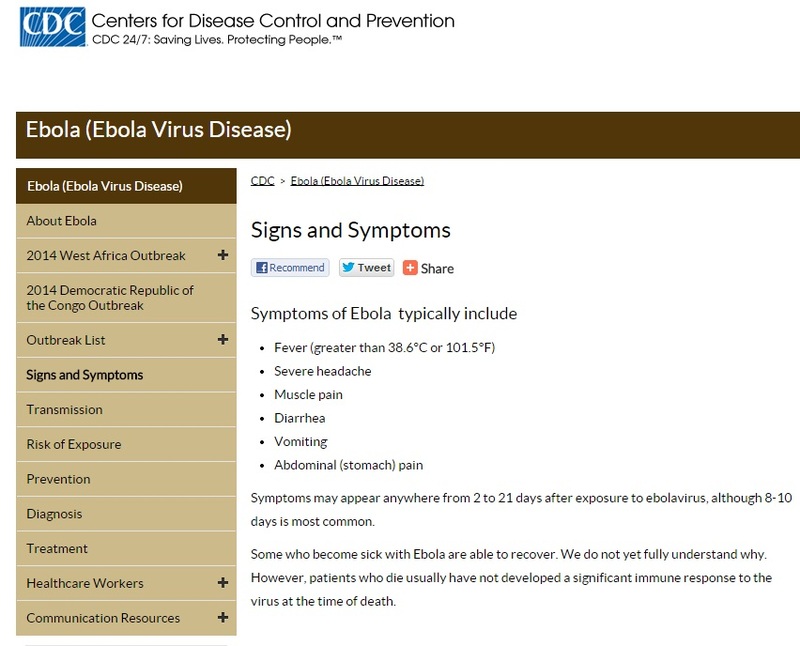 On top of that, the CDC has made some very strange changes to their website which include removing the word "contaminated air" from their Ebola fact sheet, to removing certain Ebola symptoms from their website as well. 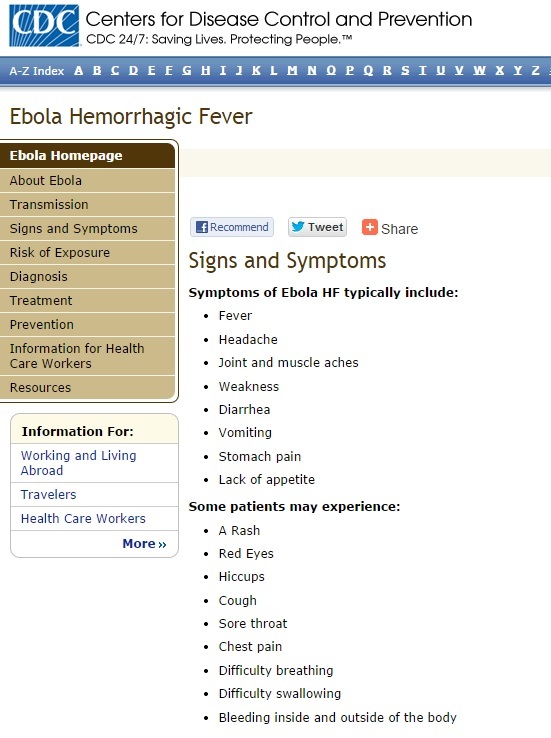 (CDC Ebola Signs and Symptoms present day here and webarchive here) - Screen shots below. Keeping in mind the present day symptoms for Ebola vs the web archived version, a couple more screen shots below provide a disturbing commonality with symptoms of both smallpox and the mysterious and "rare" EV D68 that is attacking children throughout multiple states. 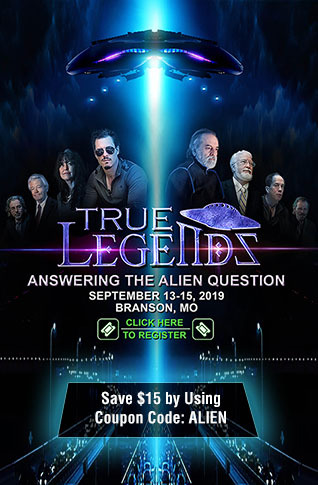 We now have Ebola and Smallpox in the news, a "rare" virus that seems to target only children now in 12 states, genetic bioweapons experimentation and a series of "coincidences" and unexplained CDC actions, that leave us with a question of whether these bioweapons are being are being prepared, perfected and/or are being released RIGHT NOW, on the general population of multiple countries, in a quest to create the ultimate doomsday virus. In the video below by JustinWoolie, we see there are multiple Ebola virus hybrid bio weapons that the CDC has laid claim to.